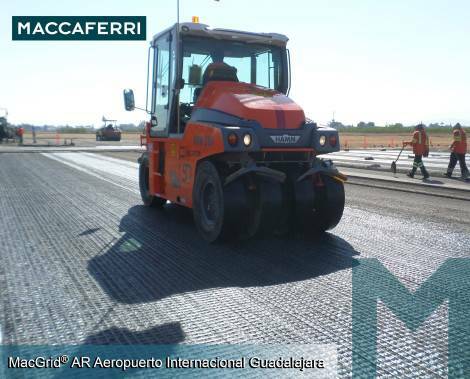 Maccaferri Mexico uses tested MacGrid AR Geogrid solutions in the Asphalt Reinforcement Project in Guadalajara International Airport. The Miguel Hidalgo y Costilla International Airport (Guadalajara International Airport), located 16 kilometers south of the city of Guadalajara, Jalisco, is the third largest airport in the Mexico. This airport displays signs of fatigue in its pavement layers. In light of this issue, Maccaferri Mexico has presented a solution to control the excess of cyclic loading cracks due to the high numbers of aircraft landings on the site. Through the use of advanced design software’s and as a result of the high level of dynamic loads present Maccaferri determined that the in order to absorb the forces generated by such high loads, the only valuable solution would be the installation of MacGrid AR Fiberglass Geogrid Mesh (a Terramesh system) with a tensile strength of 200 x 100 kN / M.
the mounting of an overlay of 13cm. Previously, a full-scale test was performed in the “International Bajio Airport” (located in the city of Leon, Guanajuato) to confirm the methodology and installation technique. The project was primarily chosen as means to establish the construction process prior to the commencement of the larger Miguel Hidalgo Airport. The test consisted of removing existing bumps in both the runway surface and 13 cm of sacrificed asphalt, including potholes. This was followed by the installation of MacGrid AR, as described in the procedure above. The results achieved have met the expectations of the customer, who subsequently has agreed to collaborate with Maccaferri Mexico S.A. de C.V., a leading provider of environmental solutions. In the project, Maccaferri de Mexico plans to use the product range, MacGrid AR, developed primarily for asphalt reinforcement and industrial paving applications. The product range includes Geogrid MacGrid AR 0.7 and composite MacGrid AR G.7 (geogrid combined with nonwoven geotextile). Both are planar structures made up of an array of fiberglass with polymer coating and a pressure sensitive adhesive (AR A.7). The project is anticipated to be completed by March 2016.